V156: A Start to The Billinghurst Stays, 17?? Rather awhile ago I shared with you some photos of a very interesting, atypical pair of 18th century stays held in our local costume and textile collection. There was much discussion as to the date of these stays, the purpose, who wore them, and why such a weird boning pattern. Curiosity has gotten the best of me, and I'm going to try these out. There are so many questions to inhibit progress - are they short because they're transitional? or were they for a child? or a very small lady? - but I thought I'd start by learning about the boning pattern and how it will shape the body. 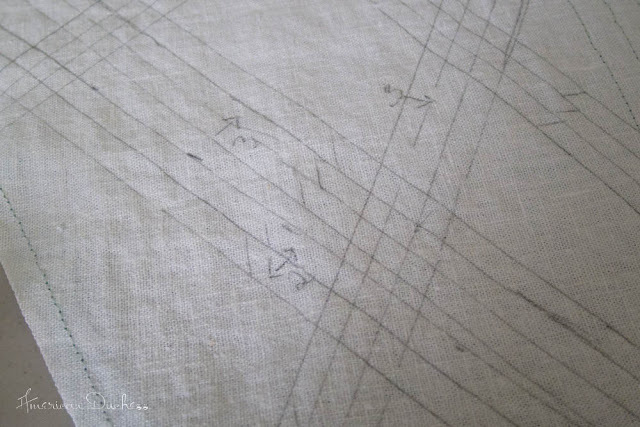 I drafted a pattern to fit my measurements, to the natural waist. This throws the proportions of the boning pattern off a little bit, and I may find a shorter version shapes differently, but first I want to see the effect these have. Left side without boning inserted; right side with all channels sewn and bones added. I marked out all the boning channels in pencil, on the inside layer, and also marked how many and where they should go. I'm constructing them from a cotton/linen blend, medium weight, with a layer of buckrammy-crin-stiffy-stuff sandwiched between. 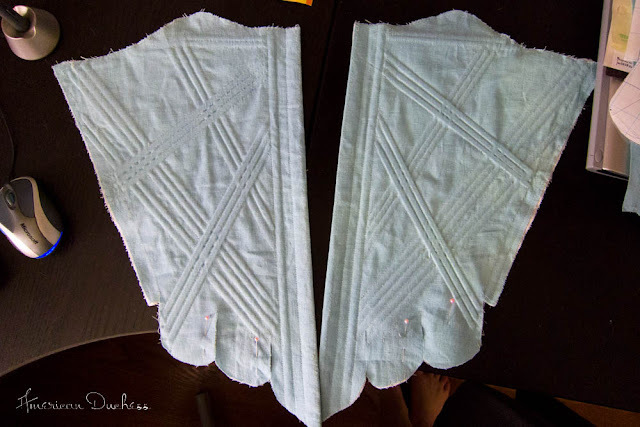 This is my progress so far - not much, and they're not in a state to be put on a body yet, but already it is appearing that they may need a stomacher. The originals in the museum didn't have a stomacher with them, but that doesn't mean it didn't exist, and other extant stays I've found that are front-closing-only have stomachers with them. It makes sense. The front pieces with all the bones in, and the channels stitched at the intersections. A close up showing the intersections. I've used 1/4" zip ties for the boning in the body, and 1/2" on the center front and back edges. But that all remains to be seen! Wow, these look intriguing! I can't wait to see how they work! wow, that's amazing... how do you get the zip ties to lie flat? iron them ? Hi Genteel - the zip ties come in the package flat, and I clip them using dog nail clippers - SO much easier than scissors. That is a totally crazy boning pattern! I can't wait to hear how they feel when you wear them and how supportive they are. woo hoo - the original would have had some uplift! The high back support and off the shoulder straps would be a supportive counter balance to the weight at the front, while the cross angled boning acts kinda like an under-wire. What amazing fun! They look great so far! That crazy boning pattern is so cool and I can't wait to see how they look. Very interesting! Can't wait to see how they look when it's all done! I half wonder if it's for someone like me who's very hourglass and find one directional boning on the body doesn't provide the cone shape. Or maybe not! Are the bones sandwhiched between different layers so they can cross with out getting in each others way? (A layer of fabric between two intersecting bones) Or are they between the same layers and touching? It doesn't look like the bones have been cut and butted up against each other. Very curious Lauren. I am wondering the same thing as Ista about the cross boning. 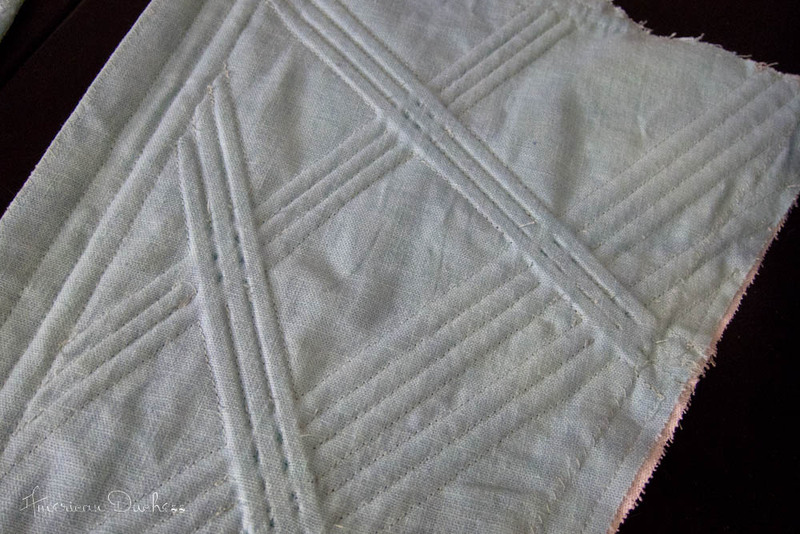 Did you sew casings and leave the junctions where bones would cross each other open? It looks that way. Can't wait to see how it works out for you as I think you have a very long waist, right? 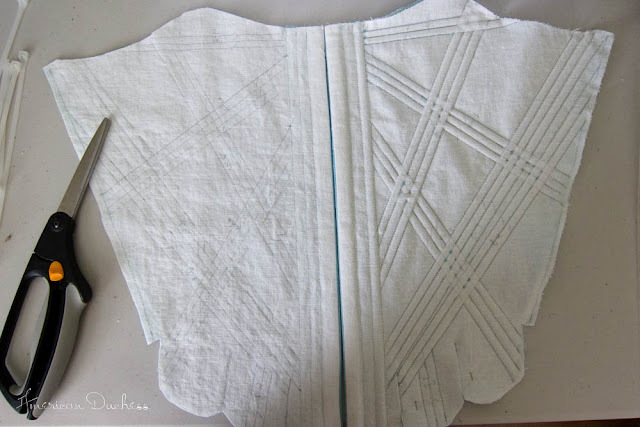 I am shorter in the waist 14 1/4" back length, a full bust (36 C-D) and no hips so I have a hard time with corset patterns built for those with more to them. Can't wait to see. Angela, yes, that is how I did it, then where the bones crossed, I stitched through all layers, like in the originals. I am long in the waist, whereas the person who wore the originals looks like she was quite short, or these were transitional. We keep forgetting that maybe someone had a crazy idea that they thought would work, so they stitched it up just to see what would happen? Just a thought. I am very short in the waist (like a two-finger-width from top of hip bone to bottom of ribs), and quite hourglass, and these certainly look like they would work very well on my shape! If the boning comes down in a directly vertical line to the hips, it seems nigh impossible to make the stays fit properly so that when I sit down I don't feel like they're trying to poke their way through under the hip bones... Of course it could always be my own poor skills as a seamstress :D In any case, this looks like a very interesting style, and I am eagerly awaiting to hear how they turn out! Hey, Lauren! I was looking through your archives and I found this post. These stays look really beautiful and you're right: completely usual! I'm seconding the "curvy, short waist" theory. I can see how these would wrap around and hug the figure rather than directly flattening it. Did you ever complete them and try them out? I never did finish these. I got to binding the tabs, then gremlins stuck these stays in the top of my closet and I never pulled them out again. I'm moving and clearing out tons of stuff, so now would be a good time to put them in a safe place to finish them up and see what effect they have on the bod. I was just about to ask whether you did finish these stays or not but it seems I'm not the first one... :D You really should finish these! I'd love to see what shape they give!